"It was a favourite destination for family outings in the 1940s and 1950s. The sixteen mile journey from Grimsby to Louth was usually undertaken by bicycle. I recall paddling in the water, crossing the stream via stepping stones and risking injury by sliding and running down the steep slopes. At the entrance to the valley was a wooden store selling fizzy drinks, ice cream, sandwiches, etc. In summer it attracted clouds of hungry wasps. 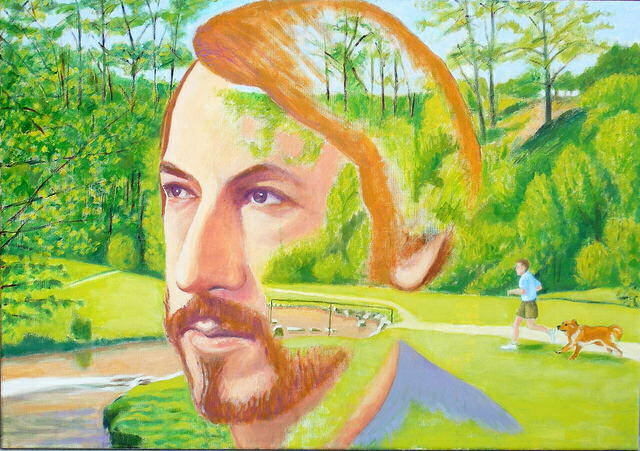 In the painting there are in fact two memories because the self-portrait is of myself in the 1970s remembering the 1950s. Superimposition - the portrait over the landscape - allowed the two memories, the two moments in time to be represented simultaneously." Of course the Hills aren't quite like that these days: there are a few more signs, litter bins, and other human constructions. I don't know whether the bridge was there in the 1950s, but that area is out of sight behind his face in any case. That clean, uncluttered view adds to the nostalgia of this piece, which I think is enhanced by the soft, bright colours. Just a boy and his dog, with the park to themselves on a sunny day? That's something that hardly ever happens any more. John is hoping for a show of new paintings in the near future.